It's not often we hone in on one product, but when it's so good you want all your friends to snaffle it - we have to. 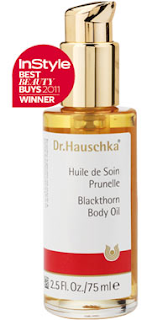 Dr Hauschka Blackthorn Body Oil (which I've incorrectly been calling Buckthorn lol) is incredible - and I'm sure so many mummas would agree should they be acquainted with this pregnancy hero. I just noticed it's even InStyle's Best Beauty Buys 2011 winner, so I'm not alone in worshipping this oil. They suggest you gently rub in, NB: not vigorously - Shh! You'll wake baby! It's best after a bath or shower to seal in the moisture and prevent dryness - so always have it to hand by the bath. It's suitable for oily, dry, sensitive, mature - and of course, preggers skin. I can't tell you how lazy little me finds this so easy to use, and so easy to sink in. I'm not sure how relevant this is to mummas but they recommend this tip for massaging, I'd say for sore/tight backs (mine is apparently very tight). Massage tip: Apply a small amount of oil to the skin (back). Grasp the top layer of skin between your thumb and index finger, gently pull the skin upwards, then release it - this should release tension and pressure on the back. Repeat five times for each area of the body - and it should relieve tightness.